Macroeconomics (from the Greek prefix makro- meaning "large" + economics) is a branch of economics dealing with the performance, structure, behavior, and decision-making of an economy as a whole. This includes regional, national, and global economies. Macroeconomists study aggregated indicators such as GDP, unemployment rates, national income, price indices, and the interrelations among the different sectors of the economy to better understand how the whole economy functions. They also develop models that explain the relationship between such factors as national income, output, consumption, unemployment, inflation, saving, investment, international trade, and international finance. While macroeconomics is a broad field of study, there are two areas of research that are emblematic of the discipline: the attempt to understand the causes and consequences of short-run fluctuations in national income (the business cycle), and the attempt to understand the determinants of long-run economic growth (increases in national income). Macroeconomic models and their forecasts are used by governments to assist in the development and evaluation of economic policy. Macroeconomics and microeconomics, a pair of terms coined by Ragnar Frisch, are the two most general fields in economics. In contrast to macroeconomics, microeconomics is the branch of economics that studies the behavior of individuals and firms in making decisions and the interactions among these individuals and firms in narrowly-defined markets. Macroeconomics encompasses a variety of concepts and variables, but there are three central topics for macroeconomic research. Macroeconomic theories usually relate the phenomena of output, unemployment, and inflation. Outside of macroeconomic theory, these topics are also important to all economic agents including workers, consumers, and producers. National output is the total amount of everything a country produces in a given period of time. Everything that is produced and sold generates an equal amount of income. The total output of the economy is measured GDP per person. The output and income are usually considered equivalent and the two terms are often used interchangeably,output changes into income. Output can be measured or it can be viewed from the production side and measured as the total value of final goods and services or the sum of all value added in the economy. Macroeconomic output is usually measured by gross domestic product (GDP) or one of the other national accounts. Economists interested in long-run increases in output study economic growth. Advances in technology, accumulation of machinery and other capital, and better education and human capital are all factors that lead to increased economic output over time. However, output does not always increase consistently over time. Business cycles can cause short-term drops in output called recessions. Economists look for macroeconomic policies that prevent economies from slipping into recessions and that lead to faster long-term growth. A chart using US data showing the relationship between economic growth and unemployment expressed by Okun's law. The relationship demonstrates cyclical unemployment. Economic growth leads to a lower unemployment rate. The amount of unemployment in an economy is measured by the unemployment rate, i.e. the percentage of workers without jobs in the labor force. The unemployment rate in the labor force only includes workers actively looking for jobs. People who are retired, pursuing education, or discouraged from seeking work by a lack of job prospects are excluded. Unemployment can be generally broken down into several types that are related to different causes. Classical unemployment theory suggests that unemployment occurs when wages are too high for employers to be willing to hire more workers. Other more modern economic theories[which?] suggest that increased wages actually decrease unemployment by creating more consumer demand. According to these more recent theories, unemployment results from reduced demand for the goods and services produced through labor and suggest that only in markets where profit margins are very low, and in which the market will not bear a price increase of product or service, will higher wages result in unemployment. Consistent with classical unemployment theory, frictional unemployment occurs when appropriate job vacancies exist for a worker, but the length of time needed to search for and find the job leads to a period of unemployment. Structural unemployment covers a variety of possible causes of unemployment including a mismatch between workers' skills and the skills required for open jobs. Large amounts of structural unemployment commonly occur when an economy shifts to focus on new industries and workers find their previous set of skills are no longer in demand. Structural unemployment is similar to frictional unemployment as both reflect the problem of matching workers with job vacancies, but structural unemployment also covers the time needed to acquire new skills in addition to the short-term search process. While some types of unemployment may occur regardless of the condition of the economy, cyclical unemployment occurs when growth stagnates. Okun's law represents the empirical relationship between unemployment and economic growth. The original version of Okun's law states that a 3% increase in output would lead to a 1% decrease in unemployment. The ten-year moving averages of changes in price level and growth in money supply (using the measure of M2, the supply of hard currency and money held in most types of bank accounts) in the US from 1875 to 2011. Over the long run, the two series show a close relationship. A general price increase across the entire economy is called inflation. When prices decrease, there is deflation. Economists measure these changes in prices with price indexes. Inflation can occur when an economy becomes overheated and grows too quickly. Similarly, a declining economy can lead to deflation. Central bankers, who manage a country's money supply, try to avoid changes in price level by using monetary policy. Raising interest rates or reducing the supply of money in an economy will reduce inflation. Inflation can lead to increased uncertainty and other negative consequences. Deflation can lower economic output. Central bankers try to stabilize prices to protect economies from the negative consequences of price changes. Changes in price level may be the result of several factors. The quantity theory of money holds that changes in price level are directly related to changes in the money supply. Most economists believe that this relationship explains long-run changes in the price level. Short-run fluctuations may also be related to monetary factors, but changes in aggregate demand and aggregate supply can also influence price level. For example, a decrease in demand due to a recession can lead to lower price levels and deflation. A negative supply shock, such as an oil crisis, lowers aggregate supply and can cause inflation. 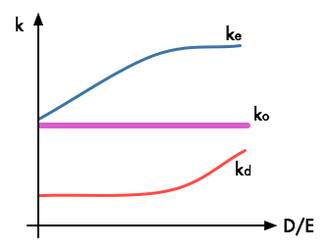 A traditional AS–AD diagram showing a shift in AD and the AS curve becoming inelastic beyond potential output. The AD-AS model has become the standard textbook model for explaining the macroeconomy. This model shows the price level and level of real output given the equilibrium in aggregate demand and aggregate supply. The aggregate demand curve's downward slope means that more output is demanded at lower price levels. 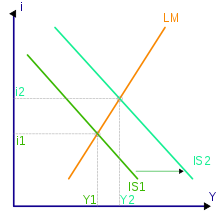 The downward slope is the result of three effects: the Pigou or real balance effect, which states that as real prices fall, real wealth increases, resulting in higher consumer demand of goods; the Keynes or interest rate effect, which states that as prices fall, the demand for money decreases, causing interest rates to decline and borrowing for investment and consumption to increase; and the net export effect, which states that as prices rise, domestic goods become comparatively more expensive to foreign consumers, leading to a decline in exports. In the conventional Keynesian use of the AS-AD model, the aggregate supply curve is horizontal at low levels of output and becomes inelastic near the point of potential output, which corresponds with full employment. Since the economy cannot produce beyond the potential output, any AD expansion will lead to higher price levels instead of higher output. The AD–AS diagram can model a variety of macroeconomic phenomena, including inflation. Changes in the non-price level factors or determinants cause changes in aggregate demand and shifts of the entire aggregate demand (AD) curve. When demand for goods exceeds supply there is an inflationary gap where demand-pull inflation occurs and the AD curve shifts upward to a higher price level. When the economy faces higher costs, cost-push inflation occurs and the AS curve shifts upward to higher price levels. The AS–AD diagram is also widely used as a pedagogical tool to model the effects of various macroeconomic policies. 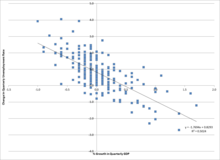 In this example of an IS/LM chart, the IS curve moves to the right, causing higher interest rates (i) and expansion in the "real" economy (real GDP, or Y). The IS–LM model gives the underpinnings of aggregate demand (itself discussed above). It answers the question “At any given price level, what is the quantity of goods demanded?” This model shows represents what combination of interest rates and output will ensure equilibrium in both the goods and money markets. The goods market is modeled as giving equality between investment and public and private saving (IS), and the money market is modeled as giving equilibrium between the money supply and liquidity preference. The IS curve consists of the points (combinations of income and interest rate) where investment, given the interest rate, is equal to public and private saving, given output The IS curve is downward sloping because output and the interest rate have an inverse relationship in the goods market: as output increases, more income is saved, which means interest rates must be lower to spur enough investment to match saving. The LM curve is upward sloping because the interest rate and output have a positive relationship in the money market: as income (identically equal to output) increases, the demand for money increases, resulting in a rise in the interest rate in order to just offset the insipient rise in money demand. 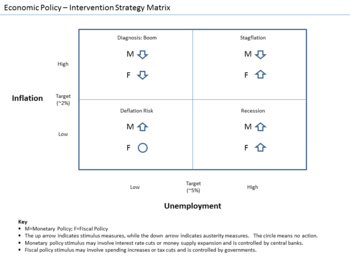 The IS-LM model is often used to demonstrate the effects of monetary and fiscal policy. Textbooks frequently use the IS-LM model, but it does not feature the complexities of most modern macroeconomic models. Nevertheless, these models still feature similar relationships to those in IS-LM. 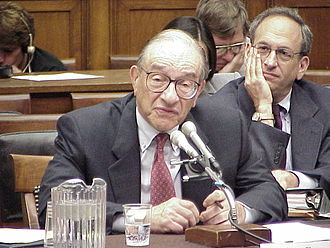 The neoclassical growth model of Robert Solow has become a common textbook model for explaining economic growth in the long-run. The model begins with a production function where national output is the product of two inputs: capital and labor. The Solow model assumes that labor and capital are used at constant rates without the fluctuations in unemployment and capital utilization commonly seen in business cycles. An increase in output, or economic growth, can only occur because of an increase in the capital stock, a larger population, or technological advancements that lead to higher productivity (total factor productivity). An increase in the savings rate leads to a temporary increase as the economy creates more capital, which adds to output. However, eventually the depreciation rate will limit the expansion of capital: savings will be used up replacing depreciated capital, and no savings will remain to pay for an additional expansion in capital. Solow's model suggests that economic growth in terms of output per capita depends solely on technological advances that enhance productivity. In the 1980s and 1990s endogenous growth theory arose to challenge neoclassical growth theory. This group of models explains economic growth through other factors, such as increasing returns to scale for capital and learning-by-doing, that are endogenously determined instead of the exogenous technological improvement used to explain growth in Solow's model. Central banks implement monetary policy by controlling the money supply through several mechanisms. Typically, central banks take action by issuing money to buy bonds (or other assets), which boosts the supply of money and lowers interest rates, or, in the case of contractionary monetary policy, banks sell bonds and take money out of circulation. Usually policy is not implemented by directly targeting the supply of money. Central banks continuously shift the money supply to maintain a targeted fixed interest rate. Some of them allow the interest rate to fluctuate and focus on targeting inflation rates instead. Central banks generally try to achieve high output without letting loose monetary policy that create large amounts of inflation. Conventional monetary policy can be ineffective in situations such as a liquidity trap. When interest rates and inflation are near zero, the central bank cannot loosen monetary policy through conventional means. Central banks can use unconventional monetary policy such as quantitative easing to help increase output. Instead of buying government bonds, central banks can implement quantitative easing by buying not only government bonds, but also other assets such as corporate bonds, stocks, and other securities. This allows lower interest rates for a broader class of assets beyond government bonds. In another example of unconventional monetary policy, the United States Federal Reserve recently made an attempt at such a policy with Operation Twist. Unable to lower current interest rates, the Federal Reserve lowered long-term interest rates by buying long-term bonds and selling short-term bonds to create a flat yield curve. Fiscal policy is the use of government's revenue and expenditure as instruments to influence the economy. Examples of such tools are expenditure, taxes, debt. For example, if the economy is producing less than potential output, government spending can be used to employ idle resources and boost output. Government spending does not have to make up for the entire output gap. There is a multiplier effect that boosts the impact of government spending. For instance, when the government pays for a bridge, the project not only adds the value of the bridge to output, but also allows the bridge workers to increase their consumption and investment, which helps to close the output gap. The effects of fiscal policy can be limited by crowding out. When the government takes on spending projects, it limits the amount of resources available for the private sector to use. Crowding out occurs when government spending simply replaces private sector output instead of adding additional output to the economy. Crowding out also occurs when government spending raises interest rates, which limits investment. Defenders of fiscal stimulus argue that crowding out is not a concern when the economy is depressed, plenty of resources are left idle, and interest rates are low. Fiscal policy can be implemented through automatic stabilizers. Automatic stabilizers do not suffer from the policy lags of discretionary fiscal policy. Automatic stabilizers use conventional fiscal mechanisms but take effect as soon as the economy takes a downturn: spending on unemployment benefits automatically increases when unemployment rises and, in a progressive income tax system, the effective tax rate automatically falls when incomes decline. Economists usually favor monetary over fiscal policy because it has two major advantages. First, monetary policy is generally implemented by independent central banks instead of the political institutions that control fiscal policy. Independent central banks are less likely to make decisions based on political motives. Second, monetary policy suffers shorter inside lags and outside lags than fiscal policy. Central banks can quickly make and implement decisions while discretionary fiscal policy may take time to pass and even longer to carry out. In the typical view of the quantity theory, money velocity (V) and the quantity of goods produced (Q) would be constant, so any increase in money supply (M) would lead to a direct increase in price level (P). The quantity theory of money was a central part of the classical theory of the economy that prevailed in the early twentieth century. Ludwig Von Mises's work Theory of Money and Credit, published in 1912, was one of the first books from the Austrian School to deal with macroeconomic topics. Macroeconomics, at least in its modern form, began with the publication of John Maynard Keynes's General Theory of Employment, Interest and Money. When the Great Depression struck, classical economists had difficulty explaining how goods could go unsold and workers could be left unemployed. In classical theory, prices and wages would drop until the market cleared, and all goods and labor were sold. Keynes offered a new theory of economics that explained why markets might not clear, which would evolve (later in the 20th century) into a group of macroeconomic schools of thought known as Keynesian economics – also called Keynesianism or Keynesian theory. In Keynes's theory, the quantity theory broke down because people and businesses tend to hold on to their cash in tough economic times – a phenomenon he described in terms of liquidity preferences. Keynes also explained how the multiplier effect would magnify a small decrease in consumption or investment and cause declines throughout the economy. Keynes also noted the role uncertainty and animal spirits can play in the economy. The generation following Keynes combined the macroeconomics of the General Theory with neoclassical microeconomics to create the neoclassical synthesis. By the 1950s, most economists had accepted the synthesis view of the macroeconomy. Economists like Paul Samuelson, Franco Modigliani, James Tobin, and Robert Solow developed formal Keynesian models and contributed formal theories of consumption, investment, and money demand that fleshed out the Keynesian framework. Milton Friedman updated the quantity theory of money to include a role for money demand. He argued that the role of money in the economy was sufficient to explain the Great Depression, and that aggregate demand oriented explanations were not necessary. Friedman also argued that monetary policy was more effective than fiscal policy; however, Friedman doubted the government's ability to "fine-tune" the economy with monetary policy. He generally favored a policy of steady growth in money supply instead of frequent intervention. Friedman also challenged the Phillips curve relationship between inflation and unemployment. Friedman and Edmund Phelps (who was not a monetarist) proposed an "augmented" version of the Phillips curve that excluded the possibility of a stable, long-run tradeoff between inflation and unemployment. When the oil shocks of the 1970s created a high unemployment and high inflation, Friedman and Phelps were vindicated. Monetarism was particularly influential in the early 1980s. Monetarism fell out of favor when central banks found it difficult to target money supply instead of interest rates as monetarists recommended. Monetarism also became politically unpopular when the central banks created recessions in order to slow inflation. New classical macroeconomics further challenged the Keynesian school. A central development in new classical thought came when Robert Lucas introduced rational expectations to macroeconomics. Prior to Lucas, economists had generally used adaptive expectations where agents were assumed to look at the recent past to make expectations about the future. Under rational expectations, agents are assumed to be more sophisticated. A consumer will not simply assume a 2% inflation rate just because that has been the average the past few years; she will look at current monetary policy and economic conditions to make an informed forecast. When new classical economists introduced rational expectations into their models, they showed that monetary policy could only have a limited impact. Lucas also made an influential critique of Keynesian empirical models. He argued that forecasting models based on empirical relationships would keep producing the same predictions even as the underlying model generating the data changed. He advocated models based on fundamental economic theory that would, in principle, be structurally accurate as economies changed. Following Lucas's critique, new classical economists, led by Edward C. Prescott and Finn E. Kydland, created real business cycle (RBC) models of the macroeconomy. 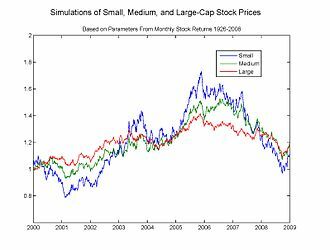 RBC models were created by combining fundamental equations from neo-classical microeconomics. In order to generate macroeconomic fluctuations, RBC models explained recessions and unemployment with changes in technology instead of changes in the markets for goods or money. Critics of RBC models argue that money clearly plays an important role in the economy, and the idea that technological regress can explain recent recessions is implausible. However, technological shocks are only the more prominent of a myriad of possible shocks to the system that can be modeled. Despite questions about the theory behind RBC models, they have clearly been influential in economic methodology. New Keynesian economists responded to the new classical school by adopting rational expectations and focusing on developing micro-founded models that are immune to the Lucas critique. Stanley Fischer and John B. Taylor produced early work in this area by showing that monetary policy could be effective even in models with rational expectations when contracts locked in wages for workers. Other new Keynesian economists, including Olivier Blanchard, Julio Rotemberg, Greg Mankiw, David Romer, and Michael Woodford, expanded on this work and demonstrated other cases where inflexible prices and wages led to monetary and fiscal policy having real effects. Like classical models, new classical models had assumed that prices would be able to adjust perfectly and monetary policy would only lead to price changes. New Keynesian models investigated sources of sticky prices and wages due to imperfect competition, which would not adjust, allowing monetary policy to impact quantities instead of prices. By the late 1990s economists had reached a rough consensus. The nominal rigidity of new Keynesian theory was combined with rational expectations and the RBC methodology to produce dynamic stochastic general equilibrium (DSGE) models. The fusion of elements from different schools of thought has been dubbed the new neoclassical synthesis. These models are now used by many central banks and are a core part of contemporary macroeconomics. New Keynesian economics, which developed partly in response to new classical economics, strives to provide microeconomic foundations to Keynesian economics by showing how imperfect markets can justify demand management. ^ Neely, Christopher J. "Okun's Law: Output and Unemployment. Economic Synopses. Number 4. 2010. http://research.stlouisfed.org/publications/es/10/ES1004.pdf. ^ Mankiw 2014, p. 634. ^ a b Healey 2002, p. 12. ^ a b Healey 2002, p. 13. ^ Healey 2002, p. 14. ^ Colander 1995, p. 173. ^ a b c d Durlauf & Hester 2008. ^ Peston 2002, pp. 386–87. ^ a b Peston 2002, p. 387. ^ Peston 2002, pp. 387–88. ^ Solow 2002, pp. 518–19. ^ Solow 2002, p. 519. ^ Blaug 2002, pp. 202–03. 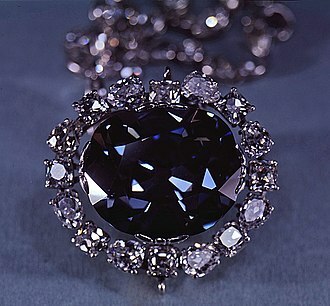 ^ a b c Mayer, 495. ^ Ye, Fred Y. (2017). Scientific Metrics: Towards Analytical and Quantitative Sciences. Springer. ISBN 978-981-10-5936-0. ^ Arestis, Philip; Sawyer, Malcolm (2003). "Reinventing fiscal policy" (PDF). Levy Economics Institute of Bard College (Working Paper, No. 381). Retrieved 7 December 2018. 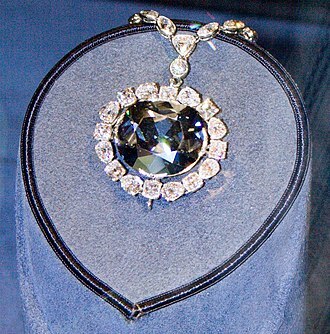 ^ a b Dimand (2008). ^ a b c Blanchard (2011), 580. ^ Snowdon, Brian; Vane, Howard R. (2005). 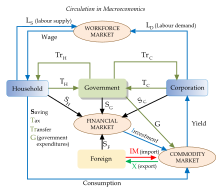 Modern Macroeconomics – Its origins, development and current state. Edward Elgar. ISBN 1-84542-208-2. ^ "Phillips Curve: The Concise Encyclopedia of Economics | Library of Economics and Liberty". www.econlib.org. Retrieved 2018-01-23. ^ a b Blanchard (2011), 587. Blanchard, Olivier (2000). Macroeconomics. Prentice Hall. ISBN 978-0-13-013306-9. Blanchard, Olivier (2011). Macroeconomics Updated (5th ed.). Englewood Cliffs: Prentice Hall. ISBN 978-0-13-215986-9. Blaug, Mark (1986), Great Economists before Keynes, Brighton: Wheatsheaf. Blaug, Mark (2002). "Endogenous growth theory". In Snowdon, Brian; Vane, Howard. An Encyclopedia of Macroeconomics. Northampton, Massachusetts: Edward Elgar Publishing. ISBN 978-1-84542-180-9. Boettke, Peter (2001). Calculation and Coordination: Essays on Socialism and Transitional Political Economy. Routledge. ISBN 978-0-415-77109-2. Dimand, Robert W. (2008). Durlauf, Steven N.; Blume, Lawrence E., eds. Macroeconomics, origins and history of. The New Palgrave Dictionary of Economics. pp. 236–44. doi:10.1057/9780230226203.1009. ISBN 978-0-333-78676-5. Durlauf, Steven N.; Hester, Donald D. (2008). "IS–LM". In Durlauf, Steven N.; Blume, Lawrence E. The New Palgrave Dictionary of Economics (2nd ed.). Palgrave Macmillan. pp. 585–91. doi:10.1057/9780230226203.0855. ISBN 978-0-333-78676-5. Retrieved 5 June 2012. Dwivedi, D.N. (2001). Macroeconomics: theory and policy. New Delhi: Tata McGraw-Hill. ISBN 978-0-07-058841-7. Friedman, Milton (1953). Essays in Positive Economics. London: University of Chicago Press. ISBN 978-0-226-26403-5. Haberler, Gottfried (1937). Prosperity and depression. League of Nations. Leijonhufvud, Axel The Wicksell Connection: Variation on a Theme. UCLA. November, 1979. Healey, Nigel M. (2002). "AD-AS model". In Snowdon, Brian; Vane, Howard. An Encyclopedia of Macroeconomics. Northampton, Massachusetts: Edward Elgar Publishing. pp. 11–18. ISBN 978-1-84542-180-9. Heijdra, Ben J.; van der Ploeg, Frederick (2002). Foundations of Modern Macroeconomics. Oxford University Press. ISBN 978-0-19-877617-8. Mankiw, N. Gregory (2014). Principles of Economics. Cengage Learning. ISBN 978-1-305-15604-3. Mises, Ludwig Von (1912). Theory of Money and Credit. Yale University Press. Mayer, Thomas (2002). "Monetary policy: role of". In Snowdon, Brian; Vane, Howard R. An Encyclopedia of Macroeconomics. Northampton, Massachusetts: Edward Elgar Publishing. pp. 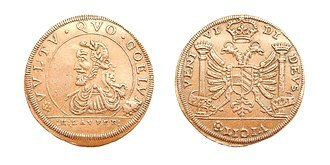 495–99. ISBN 978-1-84542-180-9. Mishkin, Frederic S. (2004). The Economics of Money, Banking, and Financial Markets. Boston: Addison-Wesley. p. 517. Peston, Maurice (2002). "IS-LM model: closed economy". In Snowdon, Brian; Vane, Howard R. An Encyclopedia of Macroeconomics. Edward Elgar. Reed, Jacob (2016). AP Economics Review, Macroeconomics. Solow, Robert (2002). "Neoclassical growth model". In Snowdon, Brian; Vane, Howard. An Encyclopedia of Macroeconomics. Northampton, Massachusetts: Edward Elgar Publishing. ISBN 978-1-84542-180-9. Snowdon, Brian, and Howard R. Vane, ed. (2002). An Encyclopedia of Macroeconomics, Description & scroll to Contents-preview links. Snowdon, Brian; Vane, Howard R. (2005). Modern Macroeconomics: Its Origins, Development And Current State. Edward Elgar Publishing. ISBN 978-1-84376-394-9. Gärtner, Manfred (2006). Macroeconomics. Pearson Education Limited. ISBN 978-0-273-70460-7. Warsh, David (2006). Knowledge and the Wealth of Nations. Norton. ISBN 978-0-393-05996-0. Levi, Maurice (2014). The Macroeconomic Environment of Business (Core Concepts and Curious Connections). New Jersey: World Scientific Publishing. ISBN 978-981-4304-34-4. Public economics is the study of government policy through the lens of economic efficiency and equity. At its most basic level, public economics provides a framework for thinking about whether or not the government should participate in economic markets and to what extent it should do so. In order to do this, microeconomic theory is utilized to assess whether the market is likely to provide efficient outcomes in the absence of governmental interference. Inherently, this involves the analysis of government taxation and expenditures. This subject encompasses a host of topics including market failures, Public economics builds on the theory of welfare economics and is ultimately used as a tool to improve social welfare. Emphasis is on analytical and scientific methods and normative-ethical analysis, as distinguished from ideology, examples of topics covered are tax incidence, optimal taxation, and the theory of public goods. The Journal of Economic Literature classification codes are one way categorizing the range of economics subjects, Public Economics, one of 19 primary classifications, has 8 categories. Diamond and James A. Mirrlees published a paper which showed that even when lump-sum taxation is not available. One of the achievements for which the great English economist A. C. Pigou is known, was his work on the divergences between marginal private costs and marginal social costs, in his book, The Economics of Welfare, Pigou describes how these divergences come about. It is, possible for the State, if it so chooses, the most obvious forms which these encouragements and restraints may assume are, of course, those of bounties and taxes. Alternatively, he describes negative externalities, such as the factory that destroys a great part of the amenities of neighboring sites, in 1960, the economist Ronald H. Coase proposed an alternative scheme whereby negative externalities are dealt with through the appropriate assignment of property rights. This result is known as the Coase theorem, Public goods, or collective consumption goods, exhibit two properties, non-rivalry and non-excludability. Something is non-excludable if its use cannot be limited to a group of people. The history of economic thought deals with different thinkers and theories in the subject that became political economy and economics, from the ancient world to the present day. It encompasses many disparate schools of economic thought, ancient Greek writers such as the philosopher Aristotle examined ideas about the art of wealth acquisition, and questioned whether property is best left in private or public hands. In the Middle Ages, scholasticists such as Thomas Aquinas argued that it was an obligation of businesses to sell goods at a just price. Fan Li, an adviser to King Goujian of Yue, wrote on economic issues, chanakya wrote the Arthashastra, a treatise on statecraft, economic policy and military strategy. Ancient Athens, a society, developed an embryonic model of democracy. Xenophons Oeconomicus is a dialogue principally about household management and agriculture, Platos dialogue The Republic describing an ideal city-state run by philosopher-kings contained references to specialization of labor and to production. Plato was the first to advocate the theory of money. Aristotles Politics analyzed different forms of the state as a critique of Platos model of a philosopher-kings, of particular interest for economists, Plato provided a blueprint of a society based on common ownership of resources. Aristotle viewed this model as an oligarchical anathema, though Aristotle did certainly advocate holding many things in common, he argued that not everything could be, simply because of the wickedness of human nature. It is clearly better that property should be private, wrote Aristotle, but the use of it common, in Politics Book I, Aristotle discusses the general nature of households and market exchanges. Aristotle himself highly disapproved of usury and cast scorn on making money through a monopoly, not useful as a means to any of the necessities of life. Thomas Aquinas was an Italian theologian and economic writer and he taught in both Cologne and Paris, and was part of a group of Catholic scholars known as the Schoolmen, who moved their enquiries beyond theology to philosophical and scientific debates. In the treatise Summa Theologica Aquinas dealt with the concept of a just price, similar in many ways to the modern concept of long run equilibrium, a just price was just sufficient to cover the costs of production, including the maintenance of a worker and his family. Aquinas argued it was immoral for sellers to raise their prices simply because buyers had a pressing need for a product, Aquinas discusses a number of topics in the format of questions and replies, substantial tracts dealing with Aristotles theory. Questions 77 and 78 concern economic issues, primarily what a just price might be, Aquinas argued against any form of cheating and recommended always paying compensation in lieu of good service. Whilst human laws might not impose sanctions for unfair dealing, divine law did, one of Aquinas main critics was Duns Scotus, originally from Duns Scotland, who taught in Oxford and Paris. If people did not benefit from a transaction, in Scotus view, Scotus said merchants perform a necessary and useful social role by transporting goods and making them available to the public. Political economy is a term used for studying production and trade, and their relations with law and government, as well as with the distribution of national income and wealth. Political economy originated in moral philosophy and it was developed in the 18th century as the study of the economies of states, or polities, hence the term political economy. In the late 19th century, the term came to replace political economy. Earlier, William Stanley Jevons, a proponent of mathematical methods applied to the subject, advocated economics for brevity and it is available as an area of study in certain colleges and universities. Originally, political economy meant the study of the conditions under which production or consumption within limited parameters was organized in nation-states, in that way, political economy expanded the emphasis of economics, which comes from the Greek oikos and nomos. Thus, political economy was meant to express the laws of production of wealth at the state level, the phrase économie politique first appeared in France in 1615 with the well-known book by Antoine de Montchrétien, Traité de l’economie politique. The French physiocrats, along with Adam Smith, John Stuart Mill, David Ricardo, Henry George, the worlds first professorship in political economy was established in 1754 at the University of Naples Federico II in southern Italy. 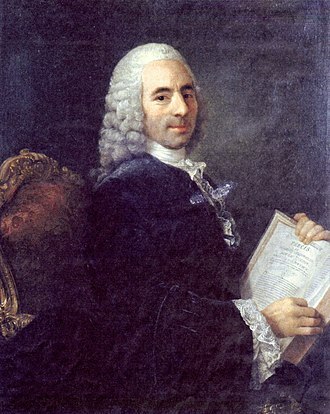 The Neapolitan philosopher Antonio Genovesi was the first tenured professor, in 1763, Joseph von Sonnenfels was appointed a Political Economy chair at the University of Vienna, Austria. Thomas Malthus, in 1805, became Englands first professor of economy, at the East India Company College, Haileybury. This left the class of 1998 as the last to be graduated with a Master of Arts in Political Economy. In the United States, political economy first was taught at the College of William and Mary, an early and continuing focus of that research program is what came to be called constitutional political economy. Other traditional topics include analysis of public policy issues as economic regulation, rent-seeking, market protection, institutional corruption. From the mid-1990s, the field has expanded, in part aided by new data sets that allow tests of hypotheses on comparative economic systems. Financial economics is the branch of economics characterized by a concentration on monetary activities, in which money of one type or another is likely to appear on both sides of a trade. Its concern is thus the interrelation of financial variables, such as prices, interest rates and shares and it has two main areas of focus, asset pricing and corporate finance, the first being the perspective of providers of capital and the second of users of capital. The subject is concerned with the allocation and deployment of economic resources and it is built on the foundations of microeconomics and decision theory. Financial econometrics is the branch of economics that uses econometric techniques to parameterise these relationships. Mathematical finance is related in that it will derive and extend the mathematical or numerical models suggested by financial economics, note though that the emphasis there is mathematical consistency, as opposed to compatibility with economic theory. Financial economics is usually taught at the level, see Master of Financial Economics. Recently, specialist undergraduate degrees are offered in the discipline, note that this article provides an overview and survey of the field, for derivations and more technical discussion, see the specific articles linked. As above, the discipline essentially explores how rational investors would apply decision theory to the problem of investment, the subject is thus built on the foundations of microeconomics and decision theory, and derives several key results for the application of decision making under uncertainty to the financial markets. Underlying all of economics are the concepts of present value. Its history is correspondingly early, Richard Witt discusses compound interest already in 1613, in his book Arithmeticall Questions, further developed by Johan de Witt and these ideas originate with Blaise Pascal and Pierre de Fermat. This decision method, fails to consider risk aversion, choice under uncertainty here, may be characterized as the maximization of expected utility. The impetus for these ideas arise from various inconsistencies observed under the expected value framework, the development here originally due to Daniel Bernoulli, and formalized by John von Neumann and Oskar Morgenstern. The concepts of arbitrage-free, rational and equilibrium are coupled with the above to derive classical financial economics, Rational pricing is the assumption that asset prices will reflect the arbitrage-free price of the asset, as any deviation from this price will be arbitraged away. This assumption is useful in pricing fixed income securities, particularly bonds, this may be seen by considering that where an arbitrage opportunity does exist, prices can be expected to change, and are therefore not in equilibrium. An arbitrage equilibrium is thus a precondition for a general economic equilibrium, the formal derivation will proceed by arbitrage arguments. All pricing models are essentially variants of this, given specific assumptions and/or conditions and this approach is consistent with the above, but with the expectation based on the market as opposed to individual preferences. In general, this premium may be derived by the CAPM as will be seen under #Uncertainty, with the above relationship established, the further specialized Arrow–Debreu model may be derived. Risk tolerance is a crucial factor in personal financial decision making. 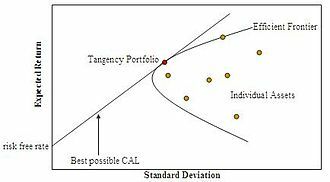 Risk tolerance is defined as individuals willingness to engage in a financial activity whose outcome is uncertain, Behavioral economics is primarily concerned with the bounds of rationality of economic agents. Behavioral models typically integrate insights from psychology and microeconomic theory, in so doing, these behavioral models cover a range of concepts, the study of behavioral economics includes how market decisions are made and the mechanisms that drive public choice. The use of the term behavioral economics in U. S. scholarly papers has increased in the past few years, there are three prevalent themes in behavioral finances, People often make decisions based on approximate rules of thumb and not strict logic. Framing, The collection of anecdotes and stereotypes that make up the mental emotional filters individuals rely on to understand and respond to events, Market inefficiencies, These include mis-pricings and non-rational decision making. During the classical period of economics, microeconomics was closely linked to psychology and they developed the concept of homo economicus, whose psychology was fundamentally rational. However, many important neo-classical economists employed more sophisticated psychological explanations, including Francis Edgeworth, Vilfredo Pareto, Economic psychology emerged in the 20th century in the works of Gabriel Tarde, George Katona, and Laszlo Garai. Expected utility and discounted utility models began to gain acceptance, generating testable hypotheses about decision-making given uncertainty and intertemporal consumption, in the 1960s cognitive psychology began to shed more light on the brain as an information processing device. In mathematical psychology, there is a longstanding interest in the transitivity of preference, prospect theory has two stages, an editing stage and an evaluation stage. In the editing stage, risky situations are simplified using various heuristics of choice, outcomes are compared to the reference point and classified as gains if greater than the reference point and losses if less than the reference point. 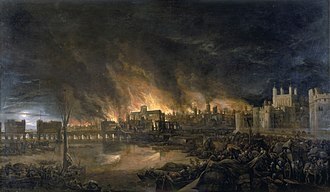 Loss aversion, Losses bite more than equivalent gains, in their 1979 paper published in Econometrica and Tversky found the median coefficient of loss aversion to be about 2.25, i. e. losses bite about 2.25 times more than equivalent gains. Prospect theory is able to explain everything that the two main existing decision theories—expected utility theory and rank dependent utility theory—can explain, prospect theory has been used to explain a range of phenomena that existing decision theories have great difficulty in explaining. These include backward bending labor supply curves, asymmetric price elasticities, tax evasion, co-movement of stock prices and consumption, in 1992, in the Journal of Risk and Uncertainty and Tversky gave their revised account of prospect theory that they called cumulative prospect theory. The new theory eliminated the editing phase in prospect theory and focused just on the evaluation phase and its main feature was that it allowed for non-linear probability weighting in a cumulative manner, which was originally suggested in John Quiggins rank dependent utility theory. One goal of microeconomics is to analyze the market mechanisms that establish relative prices among goods and services and allocate limited resources among alternative uses. Microeconomics shows conditions under which free markets lead to desirable allocations and it analyzes market failure, where markets fail to produce efficient results. Microeconomics deals with the effects of economic policies on the aspects of the economy. Particularly in the wake of the Lucas critique, much of modern macroeconomic theory has been built upon microfoundations—i. e, based upon basic assumptions about micro-level behavior. Microeconomic theory typically begins with the study of a single rational, to economists, rationality means an individual possesses stable preferences that are both complete and transitive. The technical assumption that preference relations are continuous is needed to ensure the existence of a utility function, microeconomic theory progresses by defining a competitive budget set which is a subset of the consumption set. It is at point that economists make the technical assumption that preferences are locally non-satiated. Without the assumption of LNS there is no guarantee that an individual would maximize utility. With the necessary tools and assumptions in place the utility maximization problem is developed, the utility maximization problem is the heart of consumer theory. The utility maximization problem attempts to explain the action axiom by imposing rationality axioms on consumer preferences, the utility maximization problem serves not only as the mathematical foundation of consumer theory but as a metaphysical explanation of it as well. That is, the utility maximization problem is used by economists to not only explain what or how individuals make choices, the utility maximization problem is a constrained optimization problem in which an individual seeks to maximize utility subject to a budget constraint. Economists use the extreme value theorem to guarantee that a solution to the utility maximization problem exists and that is, since the budget constraint is both bounded and closed, a solution to the utility maximization problem exists. For conceptual models of social well-being, see Social welfare function. Welfare is the provision of a level of well-being and social support for citizens without current means to support basic needs. The welfare state expands on this concept to include such as universal healthcare. In the Roman Empire, the first emperor Augustus provided the Cura Annonae or grain dole for citizens who could not afford to buy food every month, Social welfare was enlarged by the Emperor Trajan. Trajans program brought acclaim from many, including Pliny the Younger, the Song dynasty government supported multiple programs which could be classified as social welfare, including the establishment of retirement homes, public clinics, and paupers graveyards. 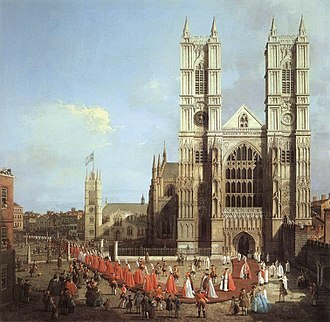 According to economist Robert Henry Nelson, The medieval Roman Catholic Church operated a far-reaching, early welfare programs in Europe included the English Poor Law of 1601, which gave parishes the responsibility for providing welfare payments to the poor. This system was modified by the 19th-century Poor Law Amendment Act. It was predominantly in the late 19th and early 20th centuries that a system of state welfare provision was introduced in many countries. Otto von Bismarck, Chancellor of Germany, introduced one of the first welfare systems for the working classes, in Great Britain the Liberal government of Henry Campbell-Bannerman and David Lloyd George introduced the National Insurance system in 1911, a system expanded by Clement Attlee. 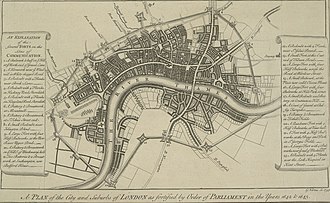 The United States inherited Englands poor house laws and has had a form of welfare since before it won its independence. Modern welfare states include Germany, the Netherlands, as well as the Nordic countries, such as Iceland, Norway, esping-Andersen classified the most developed welfare state systems into three categories, Social Democratic and Liberal. In the Islamic world, one of the Five Pillars of Islam, has collected by the government since the time of the Rashidun caliph Umar in the 7th century. The taxes were used to provide income for the needy, including the poor, orphans, according to the Islamic jurist Al-Ghazali, the government was expected to store up food supplies in every region in case a disaster or famine occurred. Ecological economics was founded in the 1980s as a modern discipline in the works of and interactions between various European and American academics. The related field of economics is, in general, a more politically applied form of the subject. According to ecological economist Malte Faber, ecological economics is defined by its focus on nature, issues of intergenerational equity, irreversibility of environmental change, uncertainty of long-term outcomes, and sustainable development guide ecological economic analysis and valuation. Positional analysis, which attempts to time and justice issues, is proposed as an alternative. Ecological economics shares many of its perspectives with feminist economics, including the focus on sustainability, justice, the first principles, deriving from the radiochemist FA Soddy, were laid out in his 1926 book Wealth and Debt in 1926. Early modern interest in ecology and economics dates back to the 1940s in the work of K. William Kapp and Karl Polanyi, the first organized meetings of modern ecological economists occurred in the 1980s. These began in 1982, at the instigation of Lois Banner, most were ecosystem ecologists or mainstream environmental economists, with the exception of Daly. In 1987, Daly and Costanza edited an issue of Ecological Modeling to test the waters, a book entitled Ecological Economics, by Juan Martinez-Alier, was published that year. 1989 saw the foundation of the International Society for Ecological Economics and publication of its journal, Ecological Economics, Robert Costanza was the first president of the society and first editor of the journal, currently edited by Richard Howarth. European conceptual founders include Nicholas Georgescu-Roegen, K. William Kapp, some key concepts of what is now ecological economics are evident in the writings of E. F. Other figures include ecologists C. S. Holling, H. T, odum and Robert Costanza, biologist Gretchen Daily and physicist Robert Ayres. CUNY geography professor David Harvey explicitly added ecological concerns to political economic literature and this parallel development in political economy has been continued by analysts such as sociologist John Bellamy Foster. 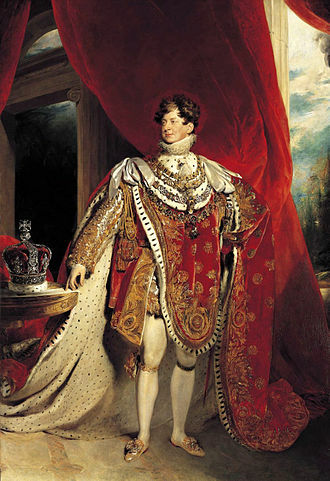 The antecedents can be traced back to the Romantics of the 19th century as well as some Enlightenment political economists of that era, concerns over population were expressed by Thomas Malthus, while John Stuart Mill predicted the desirability of the stationary state of an economy. Mill thereby anticipated insights of modern ecological economists, but without having had their experience of the social and ecological costs of the Post–World War II economic expansion. As Martinez-Alier explores in his book the debate on energy in systems can be traced into the 19th century e. g. Nobel prize-winning chemist. His magnum opus, The Entropy Law and the Economic Process, has been highly influential, in addition, the journal Ecological Economics has itself been criticized for swamping the field with mainstream economics. Once consumed, natural inputs pass out of the economy as pollution, the sink function describes an environments ability to absorb and render harmless waste and pollution, when waste output exceeds the limit of the sink function, long-term damage occurs. Economic geography is the study of the location and spatial organization of economic activities across the world. It represents a traditional subfield of the discipline of geography, many economists have approached the field in ways more typical of the discipline of economics. The subject matter investigated is strongly influenced by the researchers methodological approach, neoclassical location theorists, following in the tradition of Alfred Weber, tend to focus on industrial location and use quantitative methods. Economists such as Paul Krugman and Jeffrey Sachs have analyzed many traits related to economic geography, the name geographical economics has been suggested as an alternative. Some of the first traces of the study of aspects of economic activities can be found in seven Chinese maps of the State of Qin dating to the 4th century BC. Ancient writings can be attributed to the Greek geographer Strabos Geographika compiled almost 2000 years ago, the earliest travel journals included descriptions of the native peoples, the climate, the landscape, and the productivity of various locations. These early accounts encouraged the development of trade patterns and ushered in the era of mercantilism. 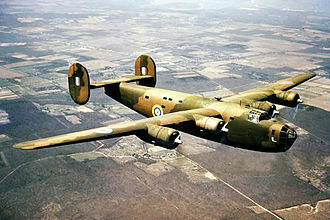 World War II contributed to the popularization of geographical knowledge generally, during environmental determinisms time of popularity, Ellsworth Huntington and his theory of climatic determinism, while greatly criticized, notably influenced the field. Valuable contributions came from location theorists such as Johann Heinrich von Thünen or Alfred Weber, other influential theories include Walter Christallers Central place theory, the theory of core and periphery. Fred K. Well-known economic geographers of this period include William Garrison, Brian Berry, Waldo Tobler, Peter Haggett, regional economic geography examines the economic conditions of particular regions or countries of the world. It deals with economic regionalization as well as economic development. Historical economic geography examines the history and development of economic structure. Critical economic geography is a taken from the point of view of contemporary critical geography. Economic growth is the increase in the inflation-adjusted market value of the goods and services produced by an economy over time. It is conventionally measured as the percent rate of increase in gross domestic product, or real GDP. Growth is usually calculated in real terms – i. e. inflation-adjusted terms – to eliminate the effect of inflation on the price of goods produced. Measurement of economic growth uses national income accounting, since economic growth is measured as the annual percent change of gross domestic product, it has all the advantages and drawbacks of that measure. The rate of economic growth refers to the annual rate of growth in GDP between the first and the last year over a period of time. Implicitly, this rate is the trend in the average level of GDP over the period. An increase in economic growth caused by efficient use of inputs is referred to as intensive growth. GDP growth caused only by increases in the amount of available for use is called extensive growth. The economic growth rate is calculated from data on GDP estimated by countries´statistical agencies, the rate of growth of GDP/capita is calculated from data on GDP and people for the initial and final periods included in the analysis. The rate of change of GDP/population is the sum of the rates of change of four variables plus their cross products. Increases in labor productivity have historically been the most important source of real per capita economic growth, increases in productivity lower the real cost of goods. Over the 20th century the price of many goods fell by over 90%. Economic growth has traditionally been attributed to the accumulation of human and physical capital, the rapid economic growth that occurred during the Industrial Revolution was remarkable because it was in excess of population growth, providing an escape from the Malthusian trap. Countries that industrialized eventually saw their population growth slow down, a known as the demographic transition. Increases in productivity are the factor responsible for per capita economic growth – this has been especially evident since the mid-19th century. Most of the growth in the 20th century was due to increased output per unit of labor, energy. The balance of the growth in output has come from using more inputs, both of these changes increase output. Heterodox economics is an umbrella term used to cover various approaches, schools, or traditions. These include anarchist, Marxian, evolutionary, Austrian, social, post-Keynesian, Mainstream economics may be called orthodox or conventional economics by its critics. Alternatively, mainstream economics deals with the rationality–individualism–equilibrium nexus and heterodox economics is more radical in dealing with the institutions–history–social structure nexus, many mainstream economists dismiss heterodox economics as fringe and irrelevant, with little or no influence on the vast majority of academic economists in the English-speaking world. A recent review documents several prominent groups of heterodox economists since at least the 1990s as working together with an increase in coherence across different constituents. Along these lines, the International Confederation of Associations for Pluralism in Economics does not define heterodox economics and has avoided defining its scope, ICAPE defines its mission as promoting pluralism in economics. One study suggests four key factors as important to the study of economics by self-identified heterodox economists, natural systems, uncertainty, a number of heterodox schools of economic thought challenged the dominance of neoclassical economics after the neoclassical revolution of the 1870s. Other heterodox schools active before and during the Great Depression included Technocracy, physical scientists and biologists were the first individuals to use energy flows to explain social and economic development. by expending what is called power or energy. Austrians and post-Keynesians who dissented from this emerged as clearly defined heterodox schools. In addition, the Marxist and institutionalist schools remained active, as a consequence, some heterodox economists, such as John B. Davis, proposed that the definition of economics has to be adapted to this new. There is no single heterodox economic theory, there are many different heterodox theories in existence, what they all share, however, is a rejection of the neoclassical orthodoxy as representing the appropriate tool for understanding the workings of economic and social life. An economist is a practitioner in the social science discipline of economics. The individual may study and apply theories and concepts from economics and write about economic policy. A generally accepted interpretation in academia is that an economist is one who has attained a Ph. D. in economics, teaches economic science, the professionalization of economics, reflected in academia, has been described as the main change in economics since around 1900. Economists debate the path they believe their profession should take, surveys among economists indicate a preference for a shift toward the latter. Most major universities have a faculty, school or department. However, many prominent economists come from a background in mathematics, political science, sociology, getting a PhD in economics takes six years, on average, with a median of 5.3 years. The Nobel Memorial Prize in Economics, established by Sveriges Riksbank in 1968, is a prize awarded to each year for outstanding intellectual contributions in the field of economics. The prize winners are announced in October every year and they receive their awards on December 10, the anniversary of Alfred Nobels death. In contrast to regulated professions such as engineering, law or medicine, in academia, to be called an economist requires a Ph. D. degree in Economics. A professional working inside of one of many fields of economics or having a degree in this subject is often considered to be an economist. In addition to government and academia, economists are employed in banking, accountancy, marketing, business administration, lobbying. Politicians often consult economists before enacting economic policy, many statesmen have academic degrees in economics. Economics graduates are employable in varying degrees depending on the regional economic scenario, small numbers go on to undertake postgraduate studies, either in economics, teacher training or further qualifications in specialist areas. Nearly 135 colleges and universities grant around 900 new Ph. D. s every year, incomes are highest for those in the private sector, followed by the federal government, with academia paying the lowest incomes. Pollution can be a simple example of market failure. If costs of production are not borne by producers but are by the environment, accident victims or others, then prices are distorted. A 1638 painting of a French seaport during the heyday of mercantilism. The publication of Adam Smith's The Wealth of Nations in 1776 is considered to be the first formalisation of economic thought. 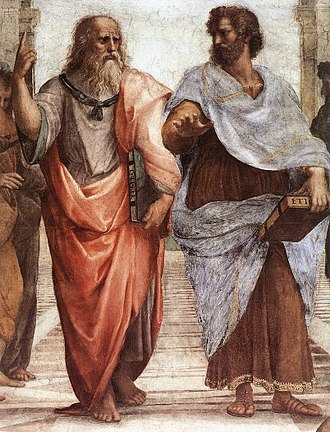 Plato and his pupil Aristotle had an enduring effect on Western philosophy. Thomas Aquinas (1225–1274) taught that high prices in response to high demand is theft. Job advertisement board in Shenzhen. An advertisement for labour from Sabah and Sarawak, seen in Jalan Petaling, Kuala Lumpur. David Hume was a friend and contemporary of Smith's. James Tassie's enamel paste medallion of Smith provided the model for many engravings and portraits that remain today. Efficient Frontier. The hyperbola is sometimes referred to as the 'Markowitz Bullet', and its upward sloped portion is the efficient frontier if no risk-free asset is available. With a risk-free asset, the straight line is the efficient frontier. The graphic displays the CAL, Capital allocation line, formed when the risky asset is a single-asset rather than the market, in which case the line is the CML. Simulated geometric Brownian motions with parameters from market data. 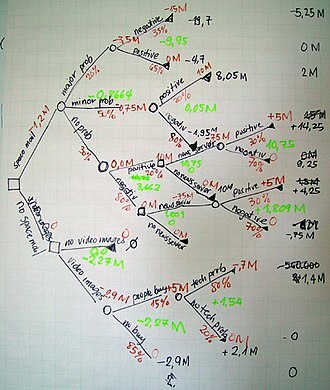 Project valuation via decision tree. Modigliani–Miller Proposition II with risky debt. As leverage (D/E) increases, the WACC (k0) stays constant. Adam Smith, author of The Wealth of Nations (1776) and The Theory of Moral Sentiments (1759). The marginal costs of a growing economy may gradually exceed the marginal benefits, however measured. Exergy analysis can be performed to find connections between economic value and the physical world. Here the costs of heating (vertical axis) are compared with the exergy content of different energy carriers (horizontal axis). Red dots and trend line indicate energy prices for consumers, blue dots and trend line indicate total price for consumers including capital expenditure for the heating system. Energy carriers included are district heating (D), ground-source heat pump (G), exhaust air heat pump (A), bioenergy meaning firewood (B), heating oil (O) and direct electric heating (E). Thorstein Veblen came from a Norwegian immigrant family in rural Mid-western America. Average years of schooling versus GDP per capita (USD 2005). Distributing alms to the poor, abbey of Port-Royal des Champs c. 1710. 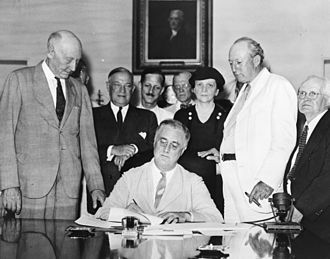 President Roosevelt signs the Social Security Act, August 14, 1935. Gross domestic product real growth rates, 1990–1998 and 1990–2006, in selected countries. 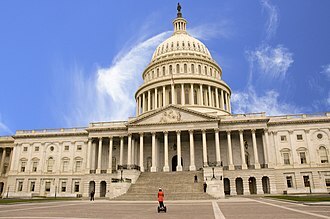 United States Capitol Building: meeting place of the United States Congress, where many tax laws are passed, which directly impact economic welfare. This is studied in the subject of public economics. 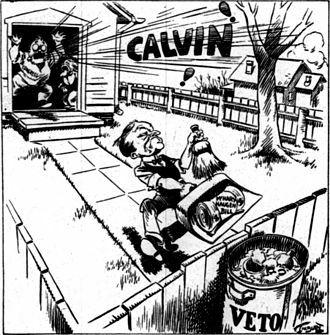 Cartoon showing US President Calvin Cooldige carrying the McNary–Haugen Farm Relief Bill in a dustpan out to a trash can labeled "VETO"
An example of culture being consumed via smartphone. Okun's law representing the relationship between GDP growth and the unemployment rate. The fitted line is found using regression analysis. 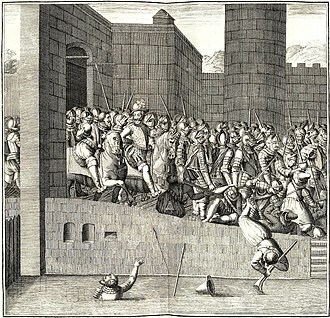 The Spartans throw Persian envoys into a well. The site of the battle today. Mount Kallidromon on the left, and the wide coastal plain formed by accretion of fluvial deposits over the centuries; the road to the right approximates the 480 BC shoreline. Leonidas and his companions devoting themselves to death. Phoenix in Cannes for The Yards in May 2000. Phoenix being interviewed at the premiere of Walk the Line in 2005. The cast of Her at the New York Film Festival in 2013. 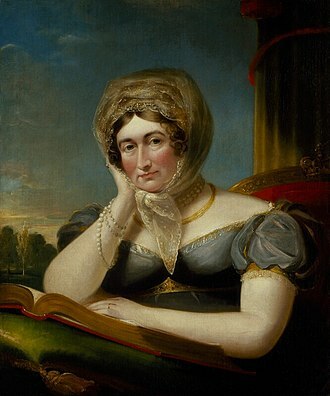 There is speculation that George's wife, Caroline of Brunswick, may have helped procure the diamond for the British monarch, but records are lacking.